Hey guys are you preparing for any government jobs. I am presenting here best sites for current affairs. If you want to crack any competitive exam then this topic is very important. Current affairs are one of the topics where a part to clear any competitive exam.There are so many websites available which one may follow for current affairs in India or all around the world. Aside from current affairs they also suggest you with best tricks and guidelines in order to clear any government exams. Here i an providing best sites for current affairs and GK for government jobs like bank, UPSC, IAS, IBPS preperation etc. May be useful for you competitive exams. The subjects of written exam, will have three parts, the time slotted will be 1 hour for each subject. The maximum marks will be 100 for each subject. If we talk about General Knowledge the most important topics will be like General knowledge include general knowledge of present current affairs and of such topics of everyday observation and experience in their scientific aspects may be expected of an educated person who has not made a study for of any scientific subject. The general knowledge paper will also include questions of geography of nature and history of India which candidate must be able to answer without any study. Are you aspirant of IAS officer then you must look at here. IAS means Indian Administrative services examination it will be conducted by under union public service co mission. IAS has total three phases. CSAT means civil services aptitude test. This phase consist of two papers each of 200 marks and two hours duration. It’s compulsory to attempt two test there is no choice at all. Here the syllabus for papers. This phase will have two tests one for Indian language and second for English.It will test your academic and intellectual talent in depth. It consist total 9 papers. The minimum qualifying marks will be 300 marks. They will test your communication skills, speaking skills and presence of mind. This phase totally depends up on your hands. Just prepare your self and be honest in front of interviewer. 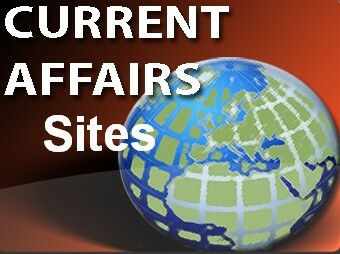 These are the best sites for current affairs and GK. According to your Competitive exam choose the best website. Are intention is you to get to know about current events in a simple manner, at the same time may useful for your competitive exams like Bank, UPSC, IAS, IBPS, GK. Thank you for the great list. Was helpful. I have shared this post to my friends. In your list of websites, I personally found BestCurrentAffairs.com as very useful. After visiting this, I can say, seriously this website has most authentic, complete and latest information in subjects that are trending in news and are actually important from competitive examination point of view. Thanks for providing this exhaustive list of websites for current affairs in India.